5 I spent 22 hours, nearly a full day, driving this week. When I spend that much time on the road, I find creative ways to entertain myself. For example, I make up stories about the people in the cars around me based on their driving style or car magnets and bumper stickers. Generally that’s easy. But this week, there was one car and driver that gave me pause. There was a Breaking Bad “Heisenberg” car magnet on the back. While I, like millions of other Americans, was quickly addicted to the television show about a high school teacher turned meth kingpin, I can’t say that’s something I’d choose to advertise on my car. I prefer to send a message that I am a law-abiding citizen with absolutely no interest in criminal activity, even as entertainment. Apparently,the fact that Amazon actually sells the magnet indicates that a significant number of people have the guts to advertise their loyalty. Even though I’m not one of them, their dauntlessness makes me smile. 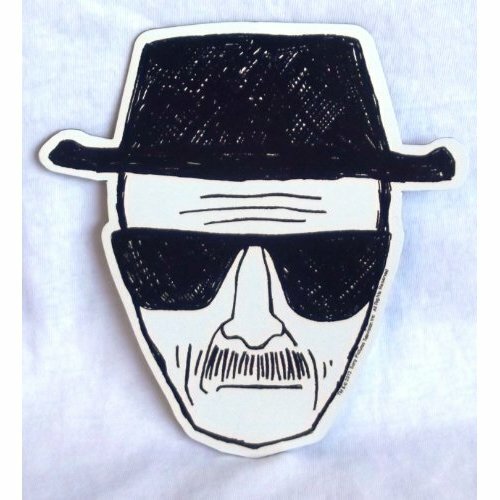 Day 302: People Who Sport the Breaking Bad Car Magnet Day 301: The song of the whippoorwill. Posted on May 4, 2014, in My life, perspective and tagged 365 reasons to smile, Breaking Bad, cars, driving, Heisenberg, home, musings, perspective, television, Thoughts. Bookmark the permalink. 2 Comments.